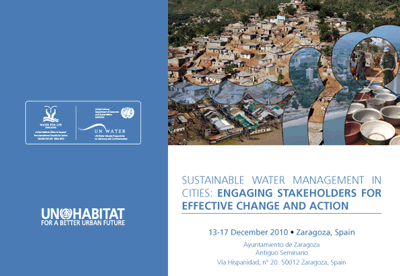 Sustainable, efficient and equitable management of water in cities has never been as important as in today's world. Achieving important internationally agreed goals - in a sustainable manner - including the Millennium Development Goals in developing country cities, requires that we do better than we have in the past. It requires that we institutionalize and act upon lessons learnt in the arena of urban water management and urban development. Capacities to make change happen in water are typically diffused between many different stakeholders including the different publics in our cities. Therefore, increasingly coming to the forefront are the holistic approaches, methods and skills needed to enable successful cooperation and collaboration, including those communication techniques which enable stakeholders to improve their performance, exchange knowledge, views and preferences and act collectively with a feasible vision of the future, promoting effective implementation. This was the main focus of this global meeting, which brought together more than 200 experts, local government officials, media specialists, key water operators and political representatives of cities and stakeholder groups to discuss the issues and propose practical ways to move forward to meet the challenges of achieving water and sanitation for all, of disseminating results to a wider audience, and considering different development contexts and regional characteristics. The meeting was also an intermediary step in the preparation for World Water Day 2011, which focused on the issue of urban water management.